We are entering the beautiful Blessing Moon cycle. A time to focus on your blessings, cultivating contentment, aligning back to your center, and enjoying the present moment. For this cycle, we thought it would be fun to share the Blessing Moon reading from the Spirit de la Lune guidebook! Feel free to try this reading with any of your other oracle and tarot decks! Grab a cup of tea and keep reading what the Blessing Moon has in store for us! Moon rise: What is rising in my life? Flow: How is the energy moving? Full Moon: What is being completed? Ebb: What is slowing down? Moon set: What am I making room for? 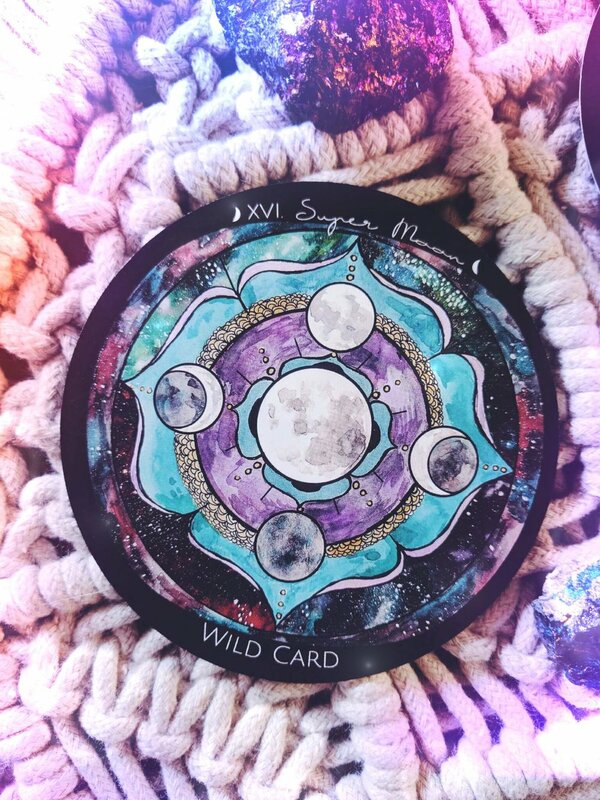 The cards are predicting a fun, a little wild, and flowing moon cycle ahead! The New Moon in Gemini can bring unexpected surprises and changes, but it is important to surrender and go with the flow. After the Full Moon will be a wonderful time to purge and cleanse yourself and your surroundings so you can get back into your creative groove. 1. Moon rise: What is rising in your life? The New Moon in Gemini takes place Wednesday, 6/13/18 and is a Super Moon! The first card pulled for the reading! We won't be able to see this moon, since she is aligned with the sun, but we will definitely feel the energy! Expect some surprising news. It is just like the Twins to do this! How you react to this news or change of course is key. When the Super Moon card is pulled it reminds us that life is unpredictable and that's what makes life a journey! All the elements are activated on a Super Moon, so tend to your elemental realms: Air (mental realm); Fire (spirit realm); Water (emotional realm); Earth (physical realm). Which realm is feeling more off, or more reactive today? Tend to your needs and pay attention to your loved ones too. They may need some support and help realigning and tuning in too. 2. Flow: How is the energy moving? The news or developments that have arisen during the New Moon could still be integrating in your system and you may be feeling overwhelmed at this point. If something is out of your control, then surrendering to what is is your best option. The flow of energy will really depend on if you resist this change or not. You always have a choice. Emotions are high and allow them to flow out to fully surrender. When you are able to surrender you are able to flow with the currents of the present moment. And sometimes that is truly the best medicine. 3: Full Moon: What is being completed? Where have you been putting your devotion? In a special project? A relationship? Maybe not so healthy habits? Whatever it may be, there will be a turning point soon. Maybe you have reached a deeper level in your relationship; or maybe with all this time and energy you have put into your creation, you can finally see the light at the end of the tunnel. With the Full Moon in Capricorn on 6/28/18, utilize this ambitious Capricorn energy and sprint for the finish line. 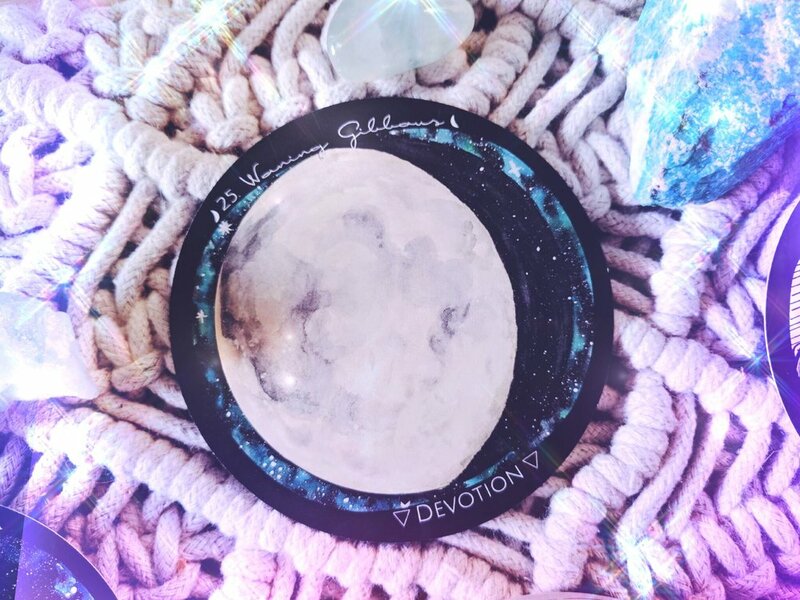 If you are not so happy with your progress, or your devotion has been lacking... make a vow on this Full Moon to yourself with how you will better use your time, energy, and willpower. A to-do list is Capricorn's best friend. You can charge it under the Full Moon to activate your willpower! Remember to do this for you and no else! 4: Ebb: What is slowing down? Air (mental realm): What patterns or beliefs are holding you back? How can you release them and create new affirmations or mantras to take their place? Fire (spirit realm): Are you feeling connected to your purpose? If yes, how can you keep nourishing this connection? In no, what needs to change so you can reconnect? Water (emotional realm): What emotions are weighing you down? Can you pinpoint the source of themes emotions and find forgiveness and compassion? Earth (physical realm): How is your body feeling? Would a cleanse or detox benefit you right now? What needs to be cleansed in your surroundings? Your answers and reflections may surprise you! Try to focus on the most pressing realm first and you will begin to feel more lighter and inspired! 5. What are you making room for? If you took the time to cleanse and reflect from the last card, you should be feeling more inspired by the next moon cycle approaching! Who doesn't want more room in their life for creativity, expression, and inspiration?! So follow your heart's whims and your imagination will guide you into the next moon cycle with more good vibes to create and manifest your desires. Get clear with hat you want and what you need to work on for yourself, put in the work, and your path will reveal itself! Maybe not in the way you would expect, but in a way that will compliment your energy and journey! We hope you have enjoyed this reading and found it refreshing and inspiring! Happy New Moon everyone! 2017 Blessing Moon Cycle Energy Reading - Abundance and Flow! This Blessing Moon cycle is going to have such a beautiful flow of energy! The Solstice just ushered in a new season (Summer for Northern Hemi & Winter for Southern Hemi), and with every new season this is a time to reset, create new intentions, and begin anew. The theme for the Blessing Moon cycle is abundance, celebration, contentment, and finding your unique rhythms and flow with the Universe. With Jupiter going direct last Full Moon, June 9th, we have an amazing positive flow of energy moving through our intentions giving us optimism, joy, playfulness, abundance, and luck! This Moon cycle is also unique because all 4 elements are present at each of the four turnings (New, First Quarter, Full, and Last Quarter Moons). This does not happen very often! Usually one or two elements are missing and there is a dominant element in the Moon cycle. When each element is present for each of the 4 major phases of the moon cycle, there is elemental equilibrium and is called a Pentagram Cycle. This Blessing Moon cycle we begin with the New Moon in Cancer (the water element); First Quarter in Libra (the air element); the Full Moon in Capricorn (the earth element); and the Last Quarter in Aries (the fire element)! With each element present, this means manifesting your intentions or abundance, will most likely happen this moon cycle! When working with magick and manifesting, each of the elemental energies need to be present and invoked. Keep reading below, to see how you can work with each of the elements this moon cycle to move forward on your path! The New Moon brings us into the watery realm of Cancer. Depending on the time zones, some people will experience the New Moon on Friday, and some on Saturday, so always consult your own moon app in your specific time zone. If you get emotional while speaking your intentions aloud, don't fight them, let them flow through you. This is infusing your intentions and speaking them aloud raises their vibrations. For this coming Full Moon, we will be making an abundance grid (there will be a blog post for the ceremony on the Full Moon so stay tuned!). Begin to Choose the crystals you want to work with. Whatever crystals you choose lay them out under the New Moon energy and let them hear your intentions too. This will infuse the crystals with your energy. The First Quarter brings us into the airy realm of Libra. Depending on the time zones, some people will experience the First quarter on Friday, and some on Saturday, so always consult your own moon app in your specific time zone. Quarter Moons are always a good time in the moon cycle to check in with yourself. The card chosen for the phase the the Wolf Moon for trusting your instincts. Libra energy may have you feeling indecisive possibility about a major direction change in your intentions for your career, or a relationship (most likely a business relationship)... trust your instincts. Check in with your guides and listen to their message. Today will be a great day to invoke the air realm and prepare your crystals further for the grid. Give them and yourself a good smudge. Use Palo Santo, sage, or any incense and cleanse each crystal and your body. This will help shift your energy in the direction you need it to go. The Full Moon brings us into the earth realm of Capricorn. Depending on the time zones, some people will experience the Full moon on Saturday, and some on Sunday, so always consult your own moon app in your specific time zone. If there was ever a Full Moon to work with career and money magick it is the Full moon in Capricorn. Capricorn energy is stable and abundant and knows how to achieve. The card pulled for the Full Moon is Devotion. Devotion is key to creating success. Committing to your goals and committing to your worth will show the universe you are ready to receive your abundance. If there is fear and resistance, ask yourself how you are self sabotaging your success. Capricorn will give you a no non-sense answer. Capricorn is practical and knows what it wants and won't let fear stand in the way. Use the energy to push forward and activate your crystal grid! (There will be a ceremony all about this, don't worry!) Make sure you have all your crystals needed for the your grid by this time and that they are all cleansed and ready to go! The Last Quarter moon leaves us in the fire realm of Aries. Aries is an interesting energy in the waning moon. We can literally burn off residual energy by creating heat in our body... detox yoga, a good sweat session, or relaxing in the sauna are a few ideas to try. 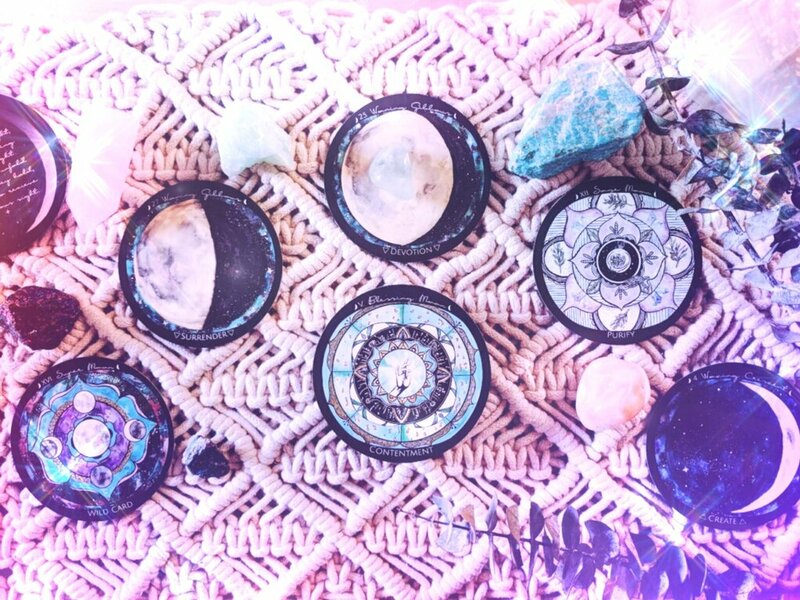 Leave your crystal grid activated until the last day of this moon cycle (July 22nd). As a thank you to the crystals and the elements, choose one crystal from the grid and give it back to the earth. Anoint this crystal with your favorite perfume oil to invoke fire and place it out in nature somewhere as an offering to the land, or leave it somewhere someone else can find it. They will find your crystal and see it as a gift or sign, thus abundance, joy, and gratitude will continue to grow and cause a ripple effect. We hope you enjoyed this reading and hope you practice these offerings this cycle! we would love to hear your story as your journey unfolds this Blessing Moon cycle! Don't forget to choose the crystals you want to use for your crystal grid for the Full Moon on July 9th! Cleanse them under the New Moon and try the Blessing Moon reading from the Spirit de la Lune guidebook! Sign up to receive updates about the deck & new Moon readings and Full moon ceremonies! Summer is in full swing in the northern hemisphere and this is a time for play, recreation, adventures, and enjoying the sunlight! Remember to enjoy the goodness and blessings you have created in your life. When you feel good, blessings will keep flowing in! This cycle begins with the New Moon in Cancer moving into Libra for the First Quarter, following with the Full Moon in Capricorn, and waning into Aries for the Last Quarter. While reading this, remember that the four lunar turnings: New, First Quarter, Full, and Last Quarter, are thresholds for the energies moving though. They mark specific energy shifts in the Lunar cycle as she moves around Gaia. They also represent the four elements: Air, Fire, Water, and Earth, and how they want to be expressed in this particular moon cycle. The Archetypes present in this cycle are the Nurturer (or you can even say Mother), the Peacemaker, the Achiever, and the Inspirer. Each of the four turnings has a different element present through the zodiac signs, meaning we can achieve a beautiful balance this cycle! There is a sense of wanting more structure, stability, and harmony with the mind/body connection. 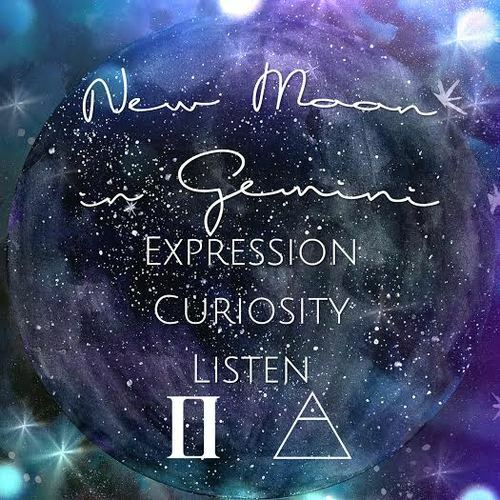 Cancer is ruled by the Moon, so this New Moon is potent with emotions. The Full Moon in Capricorn, ruled by Saturn, is wonderful for money magick, or manifesting stability. The Quarter moons are expressed with yin and yang connections of Venus (ruler of Libra) and Mars (ruler of Aries). Balancing this energy within you is important this cycle. So grab a cup a tea and simmer in these lunar insights for the 2016 Blessing Moon cycle! The New Moon in Cancer is a moon of deep emotions that tend to flood through making rational thought thrown out the window. This is not the time to be rational, and your ego will hold on tightly to what it is you "should" be feeling. Let the should's go and just be. Sentimentality, or nostalgia may hit you like a wave, or everything may feel more moving and bring you to tears. Whatever emotions rise to the surface for you, allow them to be felt. Cancerean tears are soothing and cleansing and you will feel much lighter afterward. Ask the nurturing waters of this moon submerge your spirit so you can float in this current. The card chosen for this moon phase is Rejuvenate. If you have a hard time connecting to your emotions, or you feel like you are drowning in this ocean, the best thing you can do is take a salt bath. In the bath, your body will be more connected and break the barrier of the logical mind. Rejuvenate in this sacred New Moon bath. Add three cups of sea salt to create this yummy ocean for your crab to renew in and if you can bathe with Aquamarine or Ocean jasper, to connect more to your heart chakra and inner tides. The First Quarter is the threshold for the element of Fire as the moon waxes and energy is ignited. With Libra marking this shift, we are shifting our focus towards what is surrounding us in our physical space and if it supports and nourishes our spirit at this time. If it doesn't the fire energy will motivate you to clean and create the space you need to thrive and the blessings to move through. Create harmony in your mind by filtering what you say to yourself. Focus on loving affirmations and even flirt with yourself ;) Venus has no qualms with self-love! Rose Quartz can help you soften into self-love! The card chosen for the First quarter is Movement. Move toward balance, move towards harmony. Ask yourself what is out of balance in your mind and body? How can you find a bridge to fill this gap and restore energy flow? Begin more rigorous activity and exercise to align your physical body with the rising energy moving though. Chakra balancing and focusing on whole foods to nourish your body and energy flow are so important right now. The waxing moon is when plants and our bodies absorb more nutrients! Carnelian is the perfect stone to connect with the Venus/feminine/yin energy within, while sustaining your energy and igniting your vitality! The Full Blessing Moon settles into Capricorn, the Achiever. This threshold expresses the water element and how it wants to be worked with this moon cycle. Capricorn is an Earth sign known for it's dependability, structure, and manifesting energies. Capricorn can help you channel your emotions into any projects and goals you truly desire to complete, making this a wonderful Full Moon for 'moonifesting' and attracting what you need to meet your goals and receive the blessings being poured on you! A crystal grid for attracting money using pyrite, green jade, citrine, clear quartz, and green aventurine would be perfect! Leave it out under the Full Moon to supercharge it! The card pulled is Listen. The Full Moon is so potent to connect with your intuition so listen to your inner tides to guide you. What is it you truly desire? How can you work with Capricorn to manifest your desires? Your intuition will know and show you the way. Now is not the time to let self-doubt creep in. Capricorn does not have time to be stuck in the mud! Capricorn wants to set you back on your path of success so more blessings can be received! The Last Quarter threshold welcomes in the earth energies as the energy comes back down to Gaia after the peak of the Full Moon. Aries is this gatekeeper. When Fire and Earth come together transformation can take place if you can walk through the fire. What need to be released so you can receive? What need to be released so you can be re-inspired again? What needs to be released so you can follow your passions? Aries is the Mars warrior energy, the yang energy within. Activate the warrior within you and become your own champion for thriving. Carrying Tiger's Eye will give your courage to remove your obstacles so thriving can settle in. The card pulled for this moon phase is Focus. Aries carries such a beautiful expansive, powerful energy, but if not tempered and tame can lead to a wild fire causing destruction in its path. Bring temperance to your flame. When focused this energy can be sustained and carve out what needs to be released. Candle magick is a wonderful ally right now to build your relationship with fire and to learn about the fire within you. Is your fire snuffed out? Is your fire blazing? How does your fire need to be tended? Only you know this. Carrying these crystals with you this cycle will open you to the joy, abundance, and blessings you have in your life. Be open to receiving and accept your blessings with a thank you! You are worth it. So so much. Citrine: This is such a happy, positive crystal! It connects you to your solar chakra and the light within you, so you can truly shine and be a beacon for joy, blessings, and abundance! Fuchsite: Is a stone of health and well-being. This shimmering stone opens your heart so abundance and restoration can settle in. It also relieves stress from the daily grind so you can relax and enjoy yourself! Lapis Lazuli: The stone of royalty, this connects you to the King or Queen within you. It helps you embody your truth and wisdom and opens your voice to speak authentically and rule your realm! Larimar: A beautiful healing stone, connecting you to the cosmic ocean of love and the mystic heart chakra. This stone will open your heart to receiving gracefully and with ease. Peacock Ore: The joy stone! Peacock ore's brilliant jewel tones ignite the higher chakras and connect you to the imaginative realms so you can visualize with more clarity what truly gives you joy! Opalite: This colorful stone connects all the chakras and connects you the inner child within. It can show you how sacred play can help you manifest your dreams and desires! Sunstone: Connects you to the energies of the life giving sun and the warm vitality within you. It can open you to the generosity of others and helps you give without expectation to spread more love and light!